It was one of DC’s largest non-profit night’s of the year Thursday as the female alternative to Fight Night, Knock Out Abuse took place at the West End Ritz Carlton. A host of the city’s most prominent women joined forces to raise some $560,000 to combat domestic violence and support its survivors. 2013’s event, the 20th anniversary of “Knock Out,” featured a Great Gatsby theme, with attendees and on-site models dressed in their most dapper 1920’s styled suits and flapper finery. Keynote speaker, Senator Kirsten Gillibrand [D-NY], who is well known for her passionate views and advocacy for violence against women, spoke from the podium about her zero tolerance policy for domestic abuse. 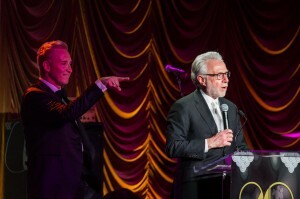 CNN’s Wolf Blitzer served as auctioneer for the live auction, and guests were treated to a surprise performance by Grammy nominated singer-songwriter Eric Benet (lead image above)… who was then auctioned off for a ladies luncheon for $31,000! Post gala, the ladies were joined by the gentleman of Fight Night for a dance filled after-party with musical entertainment provided by Questlove, DJ, drummer and joint frontman for the Grammy award-winning band The Roots. Proceeds from Knock Out Abuse will benefit four local domestic abuse support groups: Bethany House of Northern Virginia, Crossway Community, Safe Shores and DC Volunteer Lawyers Project. Previous Post: XBOX ONE Preview Party! Next Post: Iron Gate, DC’s Oldest Resto, Reopens!